Always wanted to be famous? Now you can! Let your Sims step into the spotlight with the new Expansion Pack: The Sims 4 Get Famous. Become the greatest star the Sims universe has ever known. Whether you want to become a celebrity chef or start a successful career as an actor, the sky’s the limit! Unless you decided to become a famous astronaut of course. Your Sims will need to stand out from the crowd to get noticed by the public. Don’t let your Sims be basic and dress them more appropriate for red carpet events with the new CAS additions of The Sims 4 Get Famous. The overall vibe of the CAS-items just screams fashionable, luxurious and trendy. Apart from one certain abomination, there was not one piece of clothing that disappointed me and especially the quality of the items will not let you down. The Sims 4 Get Famous adds a nice amount of trendy designer-styled clothes, perfect for the elite Sims in town. Even if you haven’t build up your reputation quite yet, you can always just act like you belong. Look fabulous while you try to reach the top of the social ladder and just fake it until you make it. But even if you choose to opt out of the lifestyle of the rich & famous, you’ll be able to find suitable clothing for your Sims with the more modest choices. Adults get a generous amount of tops, bottoms and full-body outfits. There is a nice harmony in the number of CAS-items for feminine and masculine Sims. In the past we’ve seen that feminine Sims often had more items to choose from, but this time that doesn’t seem to be the case. Some items overlap, which I personally don’t mind as they look good either way. For feminine Sims I particularly liked the jumpsuit, the bow is a very nice finishing touch. My favorite dresses would be the one with the split and the one with the lace & open back. These are just gorgeous and can make any Sim look as if they are a superstar. Some of the pieces are a bit more flashy than others and I like the diversity of the pieces. For masculine Sims I kind of missed the “wow” factor, not many items really stood out to me. Baseball shirts, colorful tuxedos, denim jackets… We’ve seen it before. It’s a good thing that some of the items come in fun color swatches to pimp things up a bit, otherwise they would be pretty underwhelming. Some of the prints are so wrong, it sort of redeems the piece completely. I mean, who doesn’t love a faux-fur, pink, cheetah-printed coat?! Overall, there was only one CAS-item that I genuinely did not like. It’s probably one of the things you either really hate or really love, unfortunately I hate them, with a passion. I am talking about a certain type of shoes for feminine Sims, and believe me, you will know which ones I am talking about. It is as if a boot and a sandal decided to breed, and then you ended up with these monstrosities. No, just… no. There is a nice balance between everyday clothing versus costumes, which I was kind of surprised about. Traumatized by all the terrifying bear costumes from previous packs, I was already afraid to see a billion costumes cluttering my CAS, but luckily this is not the case. I love the diversity of the costumes as well. They can vary from heroic chicken-in-spanx to victorian gentleman, from apocalyptic llama-raider to fluffy voidcritter. Depending on what gigs your Sims land in their acting careers, they will be able to unlock more costumes over time, so keep in mind you don’t start out with all of the costumes at once. Besides for the acting career, I can really see myself using the costumes in various ways. They would be perfect for a Spooky Party or Incognito Costume Parties. Or if you have The Sims 4 Seasons you can always use them to create new holidays or spice up the ones already in the game. Talk like a Pirate Day? Ha! More like BECOME a Pirate Day! AAARGH!! Long story short: the hairstyles for adults are amazing. My personal favorite must be the hairstyle with the rings braided into the hair. This one could be easily altered from urban rebel to trendy popstar, which I love as I like items to be versatile. In all fairness, some of the hairstyles are tagged as feminine or masculine, but I’d say most of the hairstyles would look great on any Sim. There are two new hairstyles with a pop of color in them. While I really like the shorter one, I am not a fan of the colorful ponytail. Apart from the pastel rainbow version, I just don’t like it. The way the colors just don’t blend well makes the hairstyle look patchy and cheap. As if your Sim went into an off-season Halloween store and got the cheapest wig they could find… No, thank you. To really complete your Sims’ looks The Sims 4 Get Famous adds more facial details than ever before, apart from maybe The Sims 4 Vampires, but these are conditional. Sims can now have scars on their faces, which makes them look totally badass. It also helps your Sims to get a more unique look, which could be great for storytelling. The Sims 4 Get Famous adds two more aspirations to your game. One in the Creative category, where you’ll focus on becoming an actor/actress. The other one is focused around Popularity, making your Sims hunger for fame. Both aspirations were enjoyable and fairly easy to play through. There is also a new trait for Sims aged Teen or older. Self-absorbed Sims just loooove their reflection and can’t help but to feel important. If other Sims don’t give them the amount of attention these Sims think they deserve, they’ll become tense for a while. In which case you can always make them fish for compliments from other Sims to fix their mood, hilarious! Who said kids couldn’t be trendsetters? Dressing your children just as fancy as your adult Sims will be a bit hard though. While the quality of the items is very good, the quantity is kind of sad. There are no hairstyles for both children & toddlers whatsoever. As we only got one pair of pants for toddlers, I really missed an over the top pair of pants with rhinestones in fun, child-friendly patterns. Just to name an example. Further I personally really liked the leather jacket that is available for both boys & girls. Next to that girls get two dresses, one is very nice, while the other one is simply just too long for my taste. If it was knee-high I probably would have liked it better, though I admit the design is unique compared to other dresses we have seen before in The Sims 4. Toddlers get two new tops and one pair of pants and while I really liked the patterns on the tops for the toddlers, I am just not sure if it fits in with the whole Get Famous theme. I miss a hint of gold, or a more designer-clothing vibe perhaps. It would have been funny and hella cute to see your toddlers wobble around in an onesie with a golden zipper. But what do I really miss? Well, let me tell you, but let me put this first: The Sims 4 Get Famous is amazing in the CAS-department, so please don’t get me wrong. I just really miss some accessories. The only mind-blowing accessory was a monocle for adult Sims, it’s hilarious. Besides that, children & toddlers didn’t get an accessories at all. I get that the pack might not be focused around those two age groups, but still. I guess I just wished for.. more? The pack is just lacking certain items, while in others items (like the dresses) the developers have outdone themselves. What about a dramatic pair of sunglasses? Or maybe some nice bracelets to pair with your amazing dresses for a red carpet event? Some fingerless gloves to finish off your rockstar outfit? And WHEN are we getting basic nail polish options? Can someone please tell me that. When you live the lifestyle of the rich & famous, you NEED to show these peasants who’s boss, preferably in the most obnoxious way possible. I am talking about flexing your gold EVERYWHERE. Hell yes! The Build & Buy items are so “in your face” that there is no way around your wealth. Perfect. If the golden details around your house weren’t enough, you can now equip your home lot with a new trait: Celebrity Home. Don’t use this trait lightly as unknown Sims living here will feel like a poser and get an embarrassed moodlet for a couple of hours. Let’s not forget about the increase in stalker-like fans who swarm around your house too, but hey.. at least people know someone important lives there! The Sims 4 Get Famous is the ideal pack to start building huge mansions. A lot of the Build-mode items are styled around making your houses look as extravagant as they can. It all fits the theme of this Expansion Pack perfectly, so kudos to the Gurus for that! Compared to other EP’s The Sims 4 Get Famous adds a nice amount of wallpapers and floor tiles which I am very happy about. There are some very bougie looking designs, such as the marble floors with matching walls, or the baroque wallpaper with a nice sheen on the pattern. However, a few of the designs aren’t typically used inside the house as some are styled around the Acting career, the Heroes & Villains Flooring for example. Extravagant doors & windows, marble staircases, fencing with golden llama faces… It’s all here and it’s all amazing. The only thing that bothered me with the fencing is that I could not pick where the llama’s were facing, they just randomly looked a certain way. Annoying, but not terrible. You read that right, Golden Thrones. The Buy items of The Sims 4 Get Famous includes a golden toilet, hilarious!! Who wouldn’t want to “bladder” on that?! Of course you can combine the toilet with the rest of the beautiful bathroom items, such as a bathtub with a swan and the sink with the same color swatches. The quality of the Buy-mode items is amazing and I must admit I am a bit of a fan of the designs. There are so many items with animal-prints on them, even Snooki would be jealous of your Sims. I can understand this is a very outspoken style, so luckily there are swatches with solid colors as well, such as light pink or royal blue. Very nice as well if you like it more calm around the house. The Sims 4 Get Famous adds a nice amount of Buy items, which makes it possible to completely turn your house into a paradise for wealthy Sims. There’s even a little plateau your Sims can stand on to get dressed in their walk-in closets. 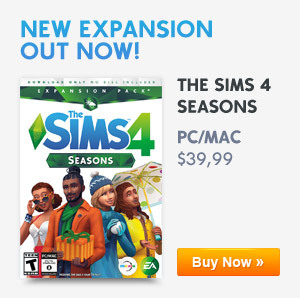 This Expansion Pack really seems to add everything your Sim could ever dream off, well except maybe some nice marble kitchen counters… obviously. Sleeping Pods are THE futuristic way to sleep for your Celebs! It really starts to feel like as if kitchens are banned from ever making it into an Expansion Pack. Again, there is no kitchen added in the pack, I am pretty sure EA is plotting against me and because it is 2018 I am offended by this. As if the moment they start planning out what items to create for the upcoming pack, the developers just scratch off anything kitchen-related to hurt my feelings. I just want matching furniture in ALL my rooms, okay? We are on the sixth EP and still none of them adds a kitchen counter, apart from the recycled ones in The Sims 4 City Living. By now you’d really think that EA would have received my angry letters about this. Emailing them wouldn’t work either, I’d just be marked as spam…. You know what?! I am going to start a non-profit organization called the SFERK, Simmers For Equal Rights of Kitchens. Together we will present them with a petition signed by all the other Simmers bothered by this as well. Maybe THAT will get their attention. Everything from this set of furniture just screams 70’s Sitcom, which happens to be one of the Acting sets as well. You will see that a lot of the decoration items that come with this pack, actually function as decoration for the Acting Career. This is especially cool as most items can be used by your Sims at least a little bit, making it great for storytelling in screenshots and machinima’s. My personal favorites are the pirate ship and the post-apocalyptic set. I just really like vibe of them both and the sets are very detailed. The only thing I did not like is how much these items clutter up their Buy-mode categories. Perhaps it’s an idea to give them their own category. On one hand they might be easily forgotten, when you place them all together in a separate section, on the other hand if people are looking for such items, they will know where to find them. The gameplay of The Sims 4 Get Famous resolves around… Getting Famous. Did I tell you people call me Captain Obvious sometimes? Well, now you know, you’re welcome. While I personally really enjoyed the gameplay, I can see why it wouldn’t be for everyone. Having your Sims be famous can get a bit overwhelming at times. My Sim even got followed by fans into the bathroom of a nightclub once, making her embarrassed by her invaded privacy. Boundaries people, boundaries!! Sheesh! Another thing I noticed when I played with the new pack is that two of my favorite Sims of The Sims 2 made their return into the game. Dirk Dreamer is now one of the pristine celebrities, while Dustin Broke is a B-lister with a Bad Reputation. A silly thing I noticed is that they used to be younger than Cassandra Goth, who is currently a Teen, which is a bit cringy to me. Apart from that I am excited to see their return to the franchise. Now we’ll just need to wait for the return of the Pleasant Twins and I’ll be one happy Simmer. Dustin Broke & Dirk Dreamer make their comeback! When you first get into the game, after spending 5 hours making your female Sim, you will notice that a new neighborhood popped up in your World Selection menu. This is Del Sol Valley, a very Hollywood-like town for your Sims to live in. People with The Sims 4 Seasons will notice that the weather overall seems to be a bit warmer here. In comparison to other worlds from previous EP’s Del Sol Valley feels a bit small. There is a smaller number of lots and there’s only one free lot with nothing on it, apart from a few trees. This doesn’t take away that it’s a nice neighborhood, it’s just less extensive than let’s say San Myshuno or Windenburg. I genuinely love the three districts of Del Sol Valley. It makes it feel like you are really moving up in the world, once you gain more wealth. Of course you don’t have to stick with the themes of the districts, but it does make it more fun to explore all the aspects of Del Sol Valley a bit more. Gaining fame seems a bit tricky at first. While it was easy to find interactions that would give fame, the system seems to be a bit slow when you are just starting out. For example, if your Sim happens to have a social media account, the more followers you have, the more fame you gain after interacting with your followers. You simply don’t have that yet at the beginning of your game. So don’t feel discouraged if it takes a while OR just use our handy trick to become a 5-Star Celebrity in a matter of seconds! You can find your Sims’ personal Fame & Reputation in their Simology and then under Public Image, a new part of the interface. It all works pretty straight forward.The more stars you have, the more perks your Sims will be able to buy for themselves. The perks can be picked in a very similar interface as with Vampire Powers in The Sims 4 Vampires. On the right you will also see what Quirks your Sims gained along the way. Quirks are temporary traits, that are influenced with your Sims’ behaviours. Quirks can vary a lot in their nature, from obsessive fans to mood swings & anger issues. With the new gameplay you’ll be engaged in your Sims’ behaviour even more than before. Next to Quirks, your Sims will also gain Reputation with the things that they do. While some positive interactions can lead to a Good Reputation, negative interactions can lead to a Bad one. Your Reputation also defines what perks you can unlock for your 3-Star (and up) Celebrities as you will unlock an extra set of perks depending on your Reputation. Also, a fun side note to the Fame & Reputation gains: your Sim can Get Famous no matter what career you choose for them. So if you want to become a Famous e-Sporter or play around with the new Stylist career (added in the latest pack) you can totally do that! Woohoo in a pile of money in your personal vault! So you’re Famous, now what? When your Sim is done climbing the Celebrity ladder, you can really enjoy the luxurious lifestyle that comes with being Famous. Eventually you’ll have all the perks unlocked and enough money to buy anything your Sim desires. You’ll notice that the more famous your Sims get, the more they’ll be recognized when you get outside their house. Other than that there are a few interactions you can do with your fans which makes the grind to fame all worth it. You can make your fans swoon, often making them collapse in the middle of the street. Further you can enter the greatest hotspots and VIP-rooms, where bouncers otherwise would have kicked you out, unless you bribed them of course. One silly thing I noticed with this, is that you can click the door at any time and then just edit the Stars needed to enter the club, oops. I personally got irritated a couple of times by the huge amount of fans my Sims started to attract while in public. They could not go on dates or hang out with friends without swarms of Sims coming from every corner of the lot. Just like a bunch of cockroaches, I tell you. After a while this became a bit too much for me, so I am glad your Sims can opt out of the fame if you happen to get sick of it. The Sims 4 Get Famous added a new active career to the game, actor/actress. It’s the first active career since The Sims 4 Get to Work and I was stoked to try it out! When you start your career you’ll join an agency, make sure to read the notifications you get from your agents, they are hilarious! Overall I really enjoyed the Actor/Actress career. The career is quite simple to work through and it was enjoyable to see all the different roles your Sim could get. The only thing that bothered me here and there was that it sometimes takes DAYS between doing an audition and then actually going to work to do the gig, it made the process a bit more slow than it needed to be. Children & Teens are able to join a new after school activity, the Drama club. The Drama Club will give them daily tasks surrounding their Creativity Skill and Acting. It’s a fun way to engage your younger Sims in their parents’ lives as they’ll be able to walk into their footsteps when they grow older. With the new Actor/Actress career comes the new Acting Skill. Sims will need this to progress through the career. You can use the mirror to practise your acting, act out scenes by yourself or with other Sims. It’s a very straight-forward skill and it’s entertaining to see your Sim act out a Dramatic Monologue with the craziest expressions on their face. Your Sims will also be able to gain the new Media Production skill. I personally really love this skill as it resembles how you can become a Social Media Influencer by creating things by yourself and working towards a great production that matters to you. You can learn more about the Media Production skill in our useful guide! The Sims 4 Get Famous, number 1 hit or total miss? Would I call The Sims 4 Get Famous the ultimate Expansion Pack? Probably not, but it’s not a total flop either. Overall my opinion is very positive about the pack, but in all honesty I am not sure if it’s enough for an Expansion Pack. It feels more like a pack between a Game Pack and Expansion Pack if you look at the amount of content. I don’t like to compare The Sims 4 packs with each other as each deserves its own unbiased opinion, but I can’t help it this time. While The Sims 4 Get to Work added three new active careers, Get Famous only added one. But then the Actor/Actress career turns out way more detailed than the other three. The world is a lot smaller than Windenburg from Get Together, but it is bigger and more detailed in comparison with Forgotten Hollow from the Vampires pack. It’s difficult and it confuses me, which is not great when you’re writing a review like I am. You can become a Famous Vlogger and work from home! Let’s take a look at each individual aspect of the pack, shall we? The Create a Sim of The Sims 4 Get Famous is almost perfect. I really loved the items in CAS, especially for adults. The quality of all the items is amazing. However, I almost feel greedy saying it, but I am a bit bummed out Children & Toddlers seemed to get ignored for the most part. They did get a few items, but I feel like it’s not enough for an Expansion Pack. The Build & Buy is very diverse and I enjoy the bougie style a lot, it suits a pack like The Sims 4 Get Famous perfectly. The items are over the top and loud, while the calmer color swatches give the opportunity to still be fancy in a more subtle way. The mid-century modern furniture is also a great addition to the game. The amount of Build & Buy options is definitely EP-status worthy. Especially if you look at the kitchen. No Expansion Pack so far adds a kitchen, so Get Famous fits right in. My whole house matches, except for one room: the kitchen. It might be super silly to some of you, but if you are anything like me, you enjoy building your houses in a certain style and this way you just can’t do that. SFERK will be coming for you EA, keep an eye on your inbox! Other than my silly grudge about the kitchens, I found the pack really entertaining to play with. I think the general Sims-fan will enjoy playing around with the Gameplay of The Sims 4 Get Famous, seeing that most Simmers play with Young Adult Sims anyways. It adds a fun new dynamic to your game and if you don’t feel like playing around with it, you can turn off the fame-gain in the options menu, while still enjoying the rest of what the pack has to offer. Previous ArticleThe Sims Mobile: Harvestfest Event Has Started!Next ArticleThe Sims 4 Consoles: Save Up To 60% Off On The Sims 4 Base Game!